WHAT ARE THE BEST ONLINE MASTER'S IN HOSPITALITY MANAGEMENT PROGRAMS? What Else Can I Expect From an Online Master's in Hospitality Management Program? A master's degree in hospitality management online is the perfect choice for a people person with a knack for bringing people together and making them feel at ease. Professionals in this field must possess soft skills like communication, leadership, problem-solving, and patience in order to succeed. Those with a graduate degree in hospitality management can pursue positions in event-planning, catering, or restaurant and hotel management. The Bureau of Labor Statistics projects that this industry will experience a job growth rate of 10% by the year 2024, which which is much faster than the national average. Not only is earning a master's of hospitality management online convenient, but it also opens the door to a variety of lucrative positions in a growing field. UCF offers a 33-credit online master's degree in hospitality management that can be completed with a thesis and non-thesis option. The master's of science in hospitality and tourism management is made up of 18 credits of core courses on topics like marketing, finances, human resources, and research data analysis. The non-thesis option includes 15 credits of elective courses on topics such as operations, project planning, industry analysis, and advanced administration. It also includes a capstone course requirement on industry-specific strategic issues. Applicants are not required to submit GRE or GMAT scores. Instead, an emphasis is placed on personal abilities and the strength of each individual's application. Those without a degree in a relevant subject are required to enroll in a number of foundational courses on the hospitality industry before moving on to major coursework. Application deadlines are July 15th, December 1st, and April 15th, for the fall, spring, and summer semesters respectively. UNO offers an online master's degree in hospitality management through the Kabacoff School of Hotel, Restaurant, and Tourism Administration. The 30-credit executive master's in hospitality and tourism management program can be completed in 18 months of full-time study, including a summer term. Students may choose a thesis or non-thesis option for the program, with thesis research requiring six credits over two semesters. This program includes 11 major courses on a variety of topics, such as industry strategic management, finance and revenue management, and destination development. Some courses are only offered in certain terms, like the tourism destination development class that is only offered in the summer term. Students must also complete 400 hours of work experience as part of the master’s. Applicants must have a bachelor's degree with a minimum 2.5 GPA and submit GMAT scores of at least 400 to be considered. FIU offers an online master's degree in hospitality management through the Chaplin School of Hospitality and Tourism Management. The master's of science in hospitality management is available in two concentrations: revenue management or real estate development. This 33-credit program can be completed in one year of full-time study. Both concentrations share 21 credits of core courses on topics like financial management, law seminars, enterprise technology, and organizational behavior. All students must also enroll in 12 credits of elective courses, as well as concentration-specific courses. Revenue management students must complete courses on investment analysis, while real estate development students enroll in classes on asset management and feasibility studies. Applicants must have a bachelor's degree with a minimum 3.0 GPA to be considered. They are not required to have relevant employment experience. FIU is accredited by the Southern Association of Colleges and Schools Commission on Colleges. UNT offers the online master's of science in hospitality management through the College of Merchandising, Hospitality & Tourism. This 36-credit program includes 15-21 credits of coursework on a wide variety of subjects, with nine credits emphasizing research methods and their practical application. Major coursework covers a variety of topics, such as promotional strategies, human capital development, and social network analysis. These courses allow students to master hospitality management fundamentals. Students can complete the program with a thesis or non-thesis option. Students can choose a thesis or non-thesis option. The research thesis consists of six credits of coursework on research methods and consumer theory. Students may elect to transfer up to nine credits from other institutions with approval from UNT faculty. Applicants must have a bachelor's degree and submit GRE or GMAT scores to be considered. UTN is accredited by the Southern Association of Colleges and Schools Commission on Colleges. UNLV offers a 30-credit executive master's of hospitality administration program that can be completed entirely online. Students must complete five required courses, four electives, and a culminating professional paper. The curriculum includes courses on a variety of topics, such as negotiation, intercultural communication, and talent acquisition. There are also unique course offerings on the management of hotel management, convention and meetings management, casino management, and food service management. These courses allow students to master hospitality management fundamentals. The school offers three academic semesters per year, which include five eight-week sessions. Students can earn their degree in one year of full-time study, although many study complete the program over a two-year span. Applicants must have a bachelor's degree with a minimum GPA of 2.75 to be considered. UNLV is accredited by the Northwest Commission on Colleges and Universities. The details of each online master's degree in hospitality will depend on the specific program and school you choose. Most master's programs in this discipline include core, elective, and concentration coursework, as well as an internship or externship requirement and culminating final project. Common concentrations in hospitality management include marketing, real estate, and self-directed entrepreneurship. While specific course topics may vary from school to school, common hospitality management coursework at the graduate level emphasizes a combination of business, marketing, and leadership topics. The major difference between programs will be the specializations and concentrations that students can choose from. These allow students to customize their degree and prepare them for their long-term career goals. Therefore, it is important to select a program that includes a specialization or concentration that will help you achieve your goals. However, every online master's degree in hospitality management will still cover the same universal core concepts such as personnel management, business law, team dynamics, and more. Below, you'll find a sample curriculum that includes foundational courses that can be found in any hospitality management program. Economics of Travel and Tourism: This course explores asset theory, tax policy, and cost-benefit analysis as they relate to statistical and economic tourism. Students learn how to utilize methods specifically designed for research of the tourism and hospitality industries. Advanced Hospitality Accounting and Finance Systems: Accounting and finance management are among the most important skills for hospitality employees. This course explores the application of incentives systems, short-term asset management, budgeting and pricing models, and performance evaluations. Advanced Personnel Systems in Restaurants, Hotels, and Institutions: This course explores advanced methods of personnel management for organizing complex employee structures within all types of hotels, restaurants, and other venues. HOW LONG DOES IT TAKE TO GET AN ONLINE MASTER'S IN HOSPITALITY MANAGEMENT? There are several factors that influence how long it takes to earn an online master's in hospitality management degree. Such factors include whether you plan to study on a full- or part-time basis, whether you prefer asynchronous or synchronous courses, and the individual requirements of each program. Some programs that have minimal internship requirements and that don't include a thesis requirements may offer an accelerated option, allowing students to earn their degree faster than they would in another program. While the total number of credits required by each program will vary, the majority of online master's degrees in hospitality management include 30-40 credits of coursework and can be completed in one or two years. 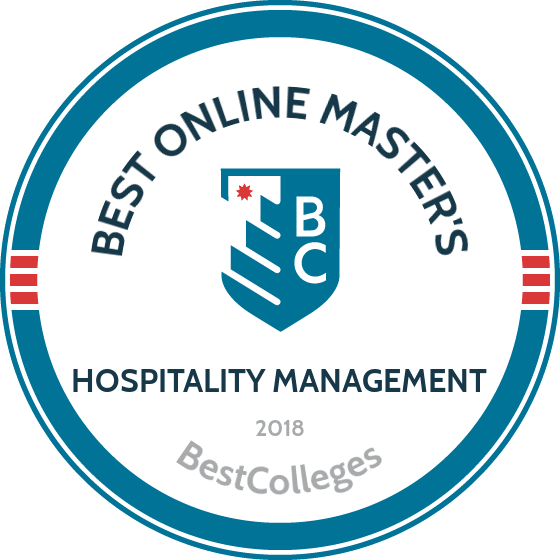 When searching for a master's degree in hospitality management online program, be sure to check each school's accreditation status. Any legitimate college or university you're considering attending should be accredited by an agency such as the Higher Learning Commission, Middle States Commission on Higher Education, or the New England Association of Schools and Colleges. There are two main types of accreditation: regional and national. Regional accreditation is considered as more prestigious than national accreditation. Regional accreditation is typically pursued by four-year public colleges and universities, while national accreditation is pursued by for-profit schools and trade or vocational institutions. Hospitality management programs may also be individually accredited by one of several industry-specific governing agencies. Programmatic accreditation in hospitality management is awarded by either the Accrediting Commission for Programs in Hospitality Administration (ACPHA), the American Culinary Federation Foundation's Accrediting Commission (ACFFAC), or the Association for the Advancement of Collegiate Schools of Business (AACSB). These accrediting agencies are overseen by the U.S. Department of Education (ED) and the Council for Higher Education Accreditation (CHEA). You can visit the ED or CHEA websites to find complete lists of all accredited institutions in the country. Earning a graduate degree in hospitality management prepares graduates for a variety of senior positions in hotel, restaurant, catering, tourism, and corporate management. While these graduates are well-suited to advanced employment opportunities in several different work environments, the possibility to fill niche positions within these fields can be even greater. Beyond developing business and leadership skills, successful hospitality management professionals are masters of creativity, empathy, and customer service. Below are a few of the most common careers for graduates with a master's in hospitality management. Lodging managers with a master's degree are eligible to pursue employment within the nation's largest and most prestigious hotel chains. While a master's degree is not the minimum requirement for the field, candidates with advanced qualifications are preferred for positions that require multi-level skills, including hospitality-specific reservation software, complex billing, and housekeeping personnel management. Food service managers are trained in a unique combination of service, culinary, and management skills. While a master's degree is not the minimum requirement for employment at the entry level, candidates with an advanced education and extensive industry experience are preferred for management jobs at upscale restaurants and hotels, catering firms, and more. Hospitality management salaries can vary based on a variety of factors, such as level of education, years of professional experience, and additional industry certifications. While graduates with an online master's degree in hospitality management will enjoy salaries that are higher than their peers with bachelor's degrees, their earning potential is still dependent on job availability and resources in their local market. Generally speaking, prospective earnings for hospitality management professionals with a graduate degree are high, due to their advantage over other candidates who simply meet the minimum requirements for the industry's entry-level positions. The following table outlines expected salaries for common positions in hospitality management at various stages of one's career. Hospitality management as a profession is very dependent on communication and customer service. As such, there are a wide variety of professional organizations that allow hospitality management professionals to develop these key skills. Becoming a member of one of these organizations will grant you access to industry events such as annual conventions, seminars, and guest speaking engagements. Members can also access job boards, continuing education opportunities, and more. The following are some of the premier national organizations for hospitality management professionals. The AHLA is the most comprehensive professional organization for lodging and hotel workers. This organization represents professionals in every sector of the hotel industry, from major chains to bed and breakfasts to management companies. This organization aims to improve education, research, service, and business operations within the hospitality and tourism industry through its programs and services, including publications, conferences, and professional teaching opportunities. The CIC is a well-known global membership organization for events that are relevant to the hospitality management industry. This organization boasts more than 100,000 members and more than 19,000 firms that participate in meetings, conventions, and exhibitions. The HSMAI emphasizes an increase in marketing and sales efforts within their respective sectors of the hospitality industry with goal of increasing traffic and revenue, developing teamwork skills, and improving industry education and research. The first step towards financing your education is to complete the Free Application for Federal Student Aid (FAFSA) form. This allows students to apply for federal financial aid, including loans that have payment deferment and reasonable interests rates. It is also required by most schools as a prerequisite before determining your eligibility for all other financial aid programs. Students can also receive scholarships, loans, grants, and work-studies from a variety of lenders and organizations. There are even some hospitality management businesses who offer scholarships and grants for students who are willing to complete an internship in the field.